?Moscow’s push for Yerevan to adopt anti-NGO legislation is just the latest sign of its determination to mold Armenia into a loyal vassal that does its bidding with no questions asked, writes Armine Sahakyan. Armine Sahakyan is a human rights activist based in Armenia. Some countries in the former Soviet Union have viewed non-governmental organizations as positive forces in the building of their societies and have taken steps to foster them. A prime example is Kazakhstan, which has declared that NGOs not only complement the work of the government, but in some cases — such as serving the disabled — do it better. It has passed laws empowering NGOs and appointed NGO leaders to many government-led task forces that address social needs. Another country that’s developed a vibrant and progressive NGO sector is Armenia. In recent months, though, the sector has come under threat. It’s not a homegrown Armenian problem. The threat is coming from Moscow, which wants its smaller neighbor to adopt the same anti-NGO policies that Russia has. It’s one more example of Russia exporting repressive policies to its neighbors. The Kremlin despises NGOs. It believes they helped finance and marshal support for the so-called ‘color revolutions’ that were aimed at democratizing Yugoslavia, Georgia and Ukraine between 2000 and 2004. It was no coincidence that Russia enacted anti-NGO legislation only 18 months after the Orange Revolution in Ukraine ushered in the pro-Western President Viktor Yushchenko. Russia’s legislation regulates the activities of a half million NGOs, including domestic branches of more than 5,000 international non-profits. The law requires an NGO to report every detail of its activities and to submit to stringent audits of the way it spends its money. The form used to document just one activity is seven pages long. This law, plus raids on international NGOs’ offices and a recent requirement that some non-profits register as “foreign agents,” have had the effect Moscow wanted: Many domestic NGOs have disbanded, and several international ones have closed their offices in Russia rather than subject themselves to continued harassment. The big loser in the closings, of course, is the Russian people, who lost services that NGOs provided. Now Russia has exported its anti-NGO legislation to Armenia, over which it has been exerting increasing control in recent months. Armenian lawmakers have drafted legislation that would require NGOs to submit detailed financial reports to the government each year. Non-profits would also be subjected to annual government audits. In addition, the proposed revisions to current NGO law would allow the government to rescind the registration of any non-profit that twice failed to comply with the requirements. On paper, the decision about whether to rescind an NGO’s license would be made by a court. But it would be hard for a court to reject such a request from the government. So the request itself would be tantamount to a kiss of death for the NGO. The most onerous provision of the legislation would give Justice Ministry officials the right to attend non-profits’ board meetings. Talk about a chilling effect on an NGO’s free discussion of issues and policy proposals! Russia sees Armenian anti-NGO legislation as a way to ensure that its neighbor toes the Kremlin line. Although Armenia’s anti-NGO legislation was drafted in November of 2014, the Armenian Parliament has yet to take it up, perhaps fearing a backlash. Many Armenians are upset about our country becoming a defacto colony of Russia. In fact, hundreds turned out to protest President Vladimir Putin’s visit to Yerevan in December of 2013, three months after Armenia backed away from a commitment to join the European Union under pressure from Moscow. Armenia’s delay in enacting the anti-NGO legislation has irritated Moscow, which has ratcheted up the pressure on Yerevan to pass it. Just three weeks ago, in late February of 2015, influential Russian lawmaker Konstantin Kosachev complained that about 350 Armenian NGOs had undermined Armenia’s ties with Russia. The ploy the non-profits had used, he said, was encouraging Armenians to embrace European values. He didn’t say “as opposed to Russian values,” but he didn’t have to. The implication was clear. Moscow’s push for Yerevan to adopt anti-NGO legislation is just the latest sign of its determination to mold Armenia into a loyal vassal that does its bidding with no questions asked. The most blatant sign was Russia forcing Armenia to join the Moscow-dominated Eurasian Economic Union rather the European Union. Armenia had spent three years laying the groundwork for joining the EU. Its abrupt about-face came an hour after Putin talked with Armenian President Serzh Sargsyan, whom he had summoned to Moscow on 3 September, 2013. No one except Sargsyan and a few trusted aides know what combination of carrots and sticks Putin used to “persuade” Armenia to drop its dream of joining the EU. Whatever the combination was, it was effective. The turnaround angered many Armenians, and underscored the fact that the Russian-Armenian relationship was not one of equals. Armenia dutifully joined the Eurasian Economic Union (EEU) on 1 January 2015, along with Russia, Kazakhstan and Belarus. EEU membership was a milestone in the Kremlin’s bid to turn our country into a Soviet-style Russian satellite. Moscow’s determination to strong-arm Yerevan into passing anti-NGO legislation is its latest move to tighten the noose. 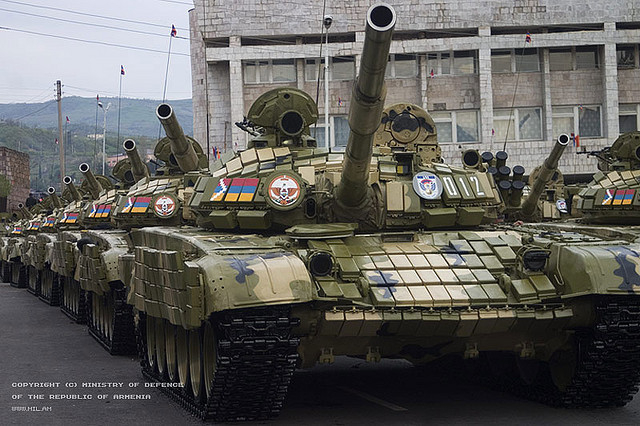 With every tightening, Armenia gets more of the Russian-style repression that many Armenians wanted to avoid. And that’s exactly what the Kremlin wants.